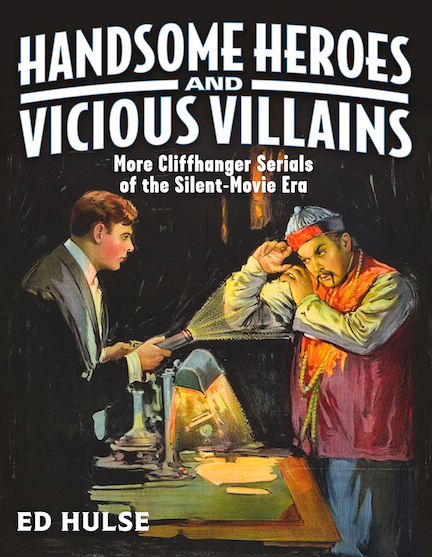 Here’s the cover for the upcoming Handsome Heroes and Vicious Villains, second in my two-volume history of silent-era movie serials. As you can see, it’s been designed to resemble its predecessor, Distressed Damsels and Masked Marauders, so that anybody familiar with the earlier book will recognize the new one as a companion volume. The spine design is also the same, so the two tomes will look fine when shelved side by side. The 100,000 words of Distressed Damsels included an overview of the silent serial and a lengthy narrative history of Pathé Exchange, the company responsible for most of the period’s classic chapter plays. Handsome Heroes offers a similar treatment of Carl Laemmle’s Universal Pictures, Pathé’s leading competitor, along with an extensive survey of serials made and distributed by the field’s other major players: Vitagraph, Arrow, Rayart, Mascot, and more. Anyone who’s read Distressed Damsels knows that it was exhaustively researched, and the same goes for Handsome Heroes — the text of which, after all, was intended for inclusion in the first book. There was no way I could feasibly publish a single volume with so much wordage and so many illustrations. Like Distressed Damsels, the upcoming tome tops 100,000 words and reproduces more than 250 rare photos, posters, ad mats, lobby cards, and frame blow-ups. Layout is well underway and I expect the book to be finished before summer’s end. But I’m going to refrain from announcing a publication date until an approved proof copy is in hand. Handsome Heroes will carry a suggested retail price of $29.95, which includes shipping if you buy here.